GBP/USD is trading around 1.3200 after Parliament voted to hold indicative votes on Wednesday. Ahead of these critical Brexit deliberations, the pound is looking for a new direction, and the upside may be more appealing. The Technical Confluences Indicator shows that cable enjoys significant support at 1.3197where we see a dense cluster that consists of the Fibonacci 61.8% one-week, the Simple Moving Average 100-15m, the SMA 50-15m, the SMA 5-1one-day, the SMA 10-1h, the Bollinger Band 1h-Middle, and the BB one-day Middle. 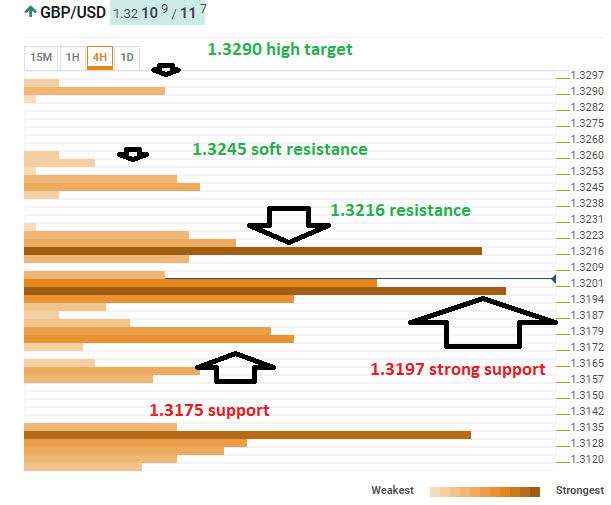 Resistance is also close by, but it is somewhat weaker at 1.3216. This is the convergence of the Fibonacci 61.8% one-day, the previous 4h-high, the Fibonacci 23.6% one-month, and the SMA 10-one-day. The initial upside target is 1.3245 which is the Pivot Point one-day Resistance 1 and the previous one-day high. Further up, 1.3290 is the PP one-day R2. Looking down, significant support awaits at 1.3175 where we see the confluence of the BB 15min-Lower, the BB 1h-Lower, the BB 4h-Middle.